Urban centers, where concentrations of pollutants can be a problem, need to consider pollution from vehicles, buses and trains when deciding which transportation system to use. For busses, the choice is between diesel, natural gas and electric, i.e., battery, propulsion. The low-cost of natural gas in the United States favors natural gas-powered buses over diesels. However, the cost of natural gas in Europe and other countries is considerably higher which favors continued use of diesel buses. This has resulted in proposals to use electric, i.e., battery-powered buses, as replacements for diesel buses. Advances in technology will likely allow the use of battery-powered buses, but costs will remain the largest obstacle to their adoption. In Geneva, Switzerland, one bus route with 12 buses is being converted to battery-powered buses with an interesting battery charging system. The ABB battery system uses 13 flash charging stations where bus batteries are given a flash charge within 20 seconds at each bus stop equipped with a flash charging station. Batteries are given a five-minute charge at the bus terminal. 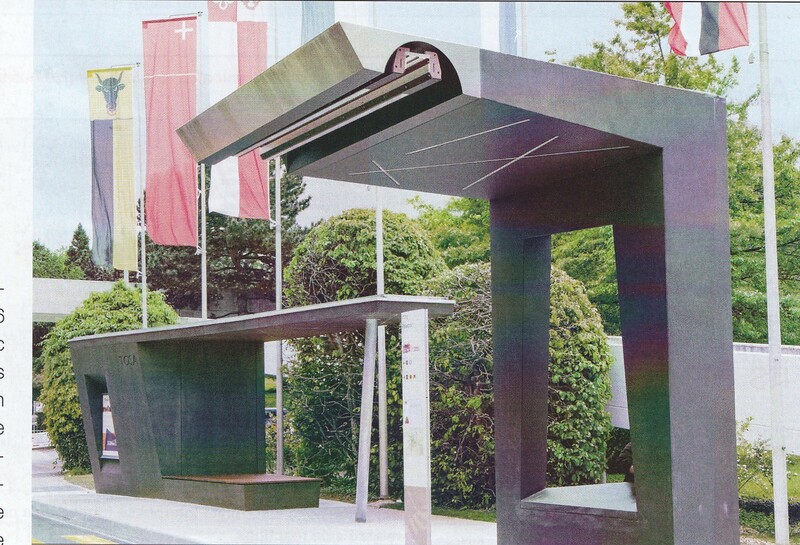 ABB designed flash charging station at 13 bus stops. The cost of this experimental electrification of 12 buses on a single bus route is $16 million. Batteries are being designed to last for ten years. While these battery-powered buses can maneuver around obstacles, such as road maintenance, they are still forced to follow an established route where flash charging stations are installed. Natural gas-powered buses are able to follow different routes, which makes them more flexible. The motivation for adopting battery-powered buses in Geneva, Switzerland, is to reduce CO2 emissions. CO2 emissions will be reduced by an estimated 1,000 tons per year, compared with existing diesel buses on this route. The $16 million cost, which could be as much as $1 million per bus when compared with comparable diesel buses, seems like a high price to pay. However, it’s not possible with available information to determine the exact incremental cost. Even so, the cost is well over $1,000 per ton of CO2. It would appear as though Geneva is paying far too much for its battery-powered bus system if CO2 is the main reason for installing the system. A more objective evaluation would use the reduction in actual pollutants made by battery-powered and natural gas-powered buses when compared with their respective costs. Various cities in the US are investigating the use of battery-powered buses that use a different charging system than Geneva’s fast charge system. New York City tested a BYD bus where charging took 4 hours at night when the buses weren’t in service. BYD is a Chinese corporation with facilities in California. New York and other cities are focusing on cutting CO2 emissions. There is no question that the initial cost of battery-powered buses is greater than buses powered by natural gas, so justification for using battery-powered buses is based primarily on cutting CO2 emissions. Using CO2 emission reductions as the criteria for buying battery-powered buses can be misleading, since most of the electricity used to charge batteries comes from power plants that use natural gas and coal, both of which emit CO2. Testing battery- and natural gas-powered buses should be done under actual operating conditions, over a sufficiently long period of time to establish true operating costs, including battery life. The cost of installing battery charging and NG fueling stations should also be included in the evaluation. It may be necessary, for example, to increase the size of the substation and distribution system feeding power to the battery-charging systems, which could be very costly. A fixation on cutting CO2 emissions is costing tax payers a great deal of money, when it’s increasingly clear that CO2 is not the primary cause of climate change. A better idea is to use compressed hydraulic fluid hybrid busses. Instead of using a battery like the Prius, a tank of hydraulic fluid is compressed. It is more efficient and costs less than a battery. The idea is the same as with the Prius, capturing braking energy in urban environments. A bus gets 2.5 miles per gallon, but a hydraulic fluid hybrid bus gets 5 miles per gallon. This can also work with battery powered busses. Weekly Climate and Energy News Roundup #265 | Watts Up With That?